Workpoints: Don't be afraid to make a mistake! The ability to receive and award activities is no doubt one of our core features here at Workpoints. We encourage employers to award and recognise their employees as much as possible. This means that we are constantly working toward improving and streamlining our awarding process. However, we also understand that nobody is perfect and that mistakes can be made. For example, a person might award an activity to someone that they didn't necessarily mean to. If you find yourself in this predicament then Workpoints has got you covered. The activity retraction feature allows a programme administrator to take back an activity that someone has awarded. This means that it disappears, as if the activity was never awarded on Workpoints. Any points that were allocated as a result of awarding the activity will be reversed and any related leader boards, graphs or reports will be updated to reflect the fact that the activity has been retracted. As an administrator you can access this feature by visiting the activity summary page of any allocated activity then clicking on the retract activity button, after which you will be prompted to confirm the retraction. 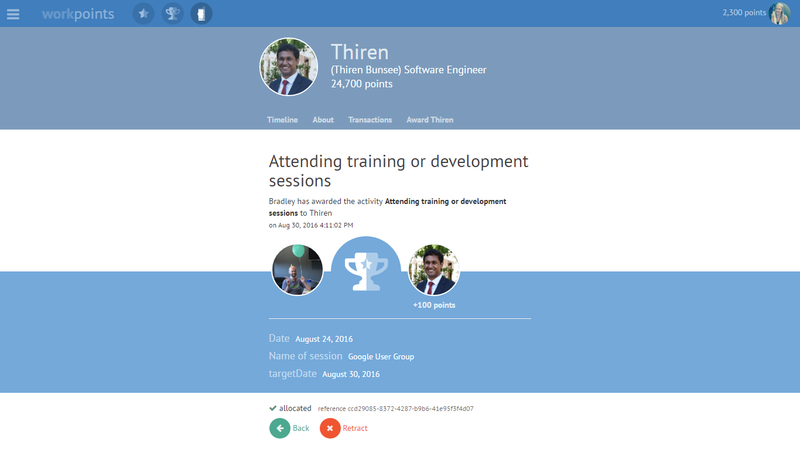 You can get to the summary page for an activity by either clicking on an entry in the employee’s activity timeline or the activity history page which shows a summary of all awarded activities on the programme. 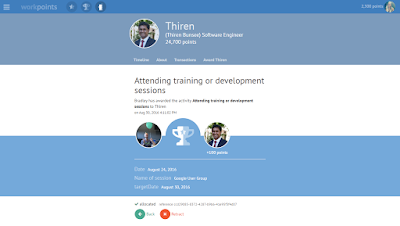 Thiren is part of our Software Engineering team here at Workpoints. He is our number one firefighter, peanut butter lover and coca-cola connoisseur.